Tennessee Cabins are the best way to enjoy your Tennessee vacation. Whether you choose to rent a cabin or build your own dream cabin, a cabin is a much better way to enjoy your vacation than a hotel room. Even for the weekend staying in a cabin is a nice cozy adventure. Log cabins are so warm and inviting you might want to stay inside your whole vacation. But that's how comfortable a warm and inviting cabin is. The thought is nice though. What could be better than going on vacation and having all the amenities of home. With a Tennessee cabin it's like you're staying in your home away from home. If you own a cabin in Tennessee you can take nice long extended vacations. How does a month or so at a time sound? After all what could be better than spending a month in your own Tennessee cabin unwinding from the daily pressures of life. Tennessee is known for its superb weather, beautiful scenery, exciting recreation, cleanliness and best of all, friendly people. Tennessee is a great place to visit for a weekend, a week long Tennessee vacation or for an extended stay. You might want to even retire in Tennessee. If so, you can search in and around the Smokies for your perfect vacation home that you can call your very own! If you are looking for a weekend or week long getaway, the Gatlinburg / Pigeon Forge area is one of the nicest in Tennessee. There is so much to do in this area that you will definitely want to get out of your Tennessee cabin and have some fun. And, if you shop around, you can find some super deals on Tennessee cabins right in the heart of the Smoky Mountains. Because the mega-resorts charge top dollar for their cabins and they are everywhere. They have some beautiful accommodations but plan to get out your wallet. During the "in season" most 1 bedroom cabins start at above $200 per night and 2 bedroom cabins start at above $250 per night. Then when you move up to larger 4 and 5 bedroom cabins to accommodate the entire family, "in season" prices start at $500 to $600 per night. However, there are some off the beaten path, small family owned resorts that cost little more than a hotel room. Many 1 bedroom cabins start at just over $100 per night and even the large 5 bedroom cabins start at $400 per night. We prefer these smaller family owned cabins or resorts because they are less noisy, your cabin is usually not right between two other cabins and sometimes you have lots of room around the resort to take a walk or maybe snooze by a babbling brook. 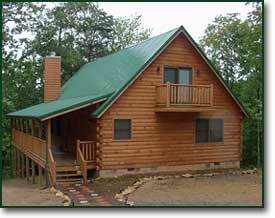 Visit our Tennessee cabin rentals page for more on our personal favorites.